Highly experienced scaffolding services operating in Essex and surrounding areas. Free Quotation for Commercial & Residential Projects. Contact: 07557 764 094. FX Scaffolding aspires to work in a safe, scheduled and efficient manner at all stages of design, maintenance, erection, and dismantling. This enables all our clients to be confident that all our scaffolding and contracting tasks will be thoroughly planned and achieved on time, on budget and in accordance with Health & Safety Compliance standards. FX Scaffolding has the correct systems to manage labour, materials, and transport to create a competitive environment for all our Commercial clients. We can deliver and erect the scaffolding for you. Our commitment to excellence is found in every project we undertake. We provide friendly professional advice, the highest standard of service and scaffolding equipment for every need. From major contracts to Residential DIY jobs, helping all trades achieve their goals. We have an extensive range of scaffolding systems enabling us to do most projects in Romford, Essex. Please have a look around our website and should you require any further details regarding the company or the services that we offer, please do not hesitate to Contact us. Highly Experienced – Founded by director Jason Pearce who has over 20 years experience, all members are CITB Trained Professionals and hold CISRS Cards to work in industrial, commercial and residential environments. 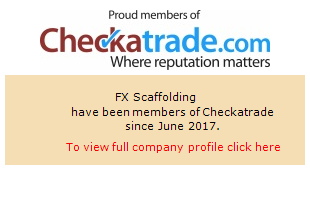 Scaffolding Specialists – Service oriented, expert residential and commercial team providing affordable domestic scaffolding solutions throughout Essex, London, Kent and the surrounding counties. Top Quality – We only use the best equipment on all projects; fully galvanised heavy duty scaffolding. Fully Insured - Public liability insured up to £10m. Happy to provide free full written quotations and advice.